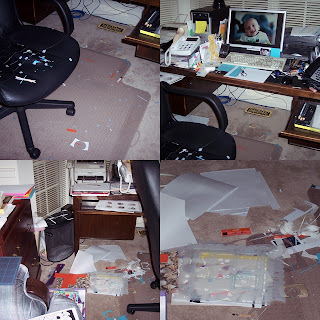 This is the aftermath of "Tina's Publishing" of Teddy's First year. We had a 1-year birthday party yesterday and she went to bed at 03:30 a.m. the night before. Bad mood anyone? Those of you that know the Cleaning Terminator would be astonished that she left this cleanup job for 2.5 days. It is still here at 12:30 p.m. on Sunday. Wow! I can't wait to see that publication. How did Teddy enjoy his first birthday party? Party was great, except he definitely missed his Great Aunts, Great Uncles, and Great Mamaw! OMG and I am not shocked it was still there....seemed there was a party gong on!! I bet you it's cleaned up now!